Bus from Kuala Terengganu to Johor Bahru is only public land transportation connecting people between two cities. Travellers rely on this bus service is because KTM train network does not cover the state of Terengganu. There are flight operating between Kuala Terengganu and Johor Bahru. However, even with the stiff competition from budget airlines, bus from Kuala Terengganu to Johor Bahru remains as the preferred choices among them due to cheaper cost. Transnasional and Maju Express are the two branded bus operators offering bus from Kuala Terengganu to Johor Bahru. Transnasional is the larger player in this bus route with 3 daily departures while Maju Express has 2 daily departures. The first bus starts as early as 9:00am and the last bus leave the bus terminal at 9:30pm. Maju Express is reputable with their spacious and thick cushion seating. Many locals prefer to travel with them because of more comfortable seating considering the long journey. The duration from Kuala Terengganu to Johor Bahru is approximately take about 9 hours, depending on the traffic and weather condition. Because it is a long journey, one washroom break will be given during the journey. Additional break will be given upon request from the driver. The bus fare is usually charged at RM 48.60 for adult and RM 36.50 for child. The departure point from Kuala Terengganu to Johor Bahru is MBKT Bus Terminal while the arrival point is Johor Bahru Larkin Bus Terminal. Passengers arriving at Johor Bahru Larkin Bus Terminal can take a taxi or city bus to LEGOLAND Malaysia Theme Park from there. Booking online has now been made easier with BusOnlineTicket.com. 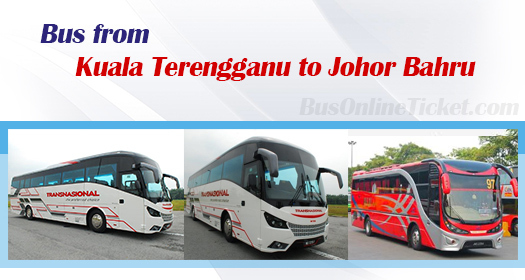 Book your bus ticket from Kuala Terengganu to Johor Bahru online now to secure your seat and cut short the waiting time. We also offer LEGOLAND Malaysia Theme Park ticket in our website. For more information, visit BusOnlineTicket.com now.